As I mentioned in my first post I’ve been giving a lot of thought to the way the Society communicates, and in researching its history I’ve been very struck by our use in the past of mass media, including newspapers and television, to tell the world about what we’re doing. This was a perfect fit with the EES’ remit to educate the public – on a grander scale than we could achieve otherwise – and a perfect opportunity to promote its work. 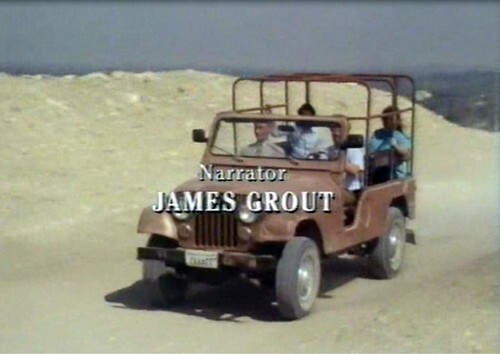 The EES Survey of Memphis team shown driving to the site at the beginning of the BBC Chronicle film ‘Memphis: Capital of Egypt’ (1991). Having started to form a few ideas about how the Society changed its approach to communicating with a wide audience over the years (see my last post), and with a great deal of emphasis placed recently on the need to promote the EES and to reach new audiences, it seems very timely that we should now be involved in a major television documentary for the first time in years. Having made ‘Egypt’s Lost Cities’ a film featuring Sarah Parcak which was broadcast on BBC1 in May 2011, the factual department at BBC Wales were inspired to make a follow-up. This time they would focus on the history of archaeology in Egypt, and in particular on Flinders Petrie, the ‘father of archaeology’. My colleagues and I were involved in the development of the first programme, contributing thoughts and ideas as to what Sarah’s methods might be used to test; we even hosted a meeting with the production team at Doughty Mews which was attended by Sarah and geologist Judith Bunbury, a regular member of EES field teams who appeared in the film as well. At that time, the team were also thinking of producing some short films for the web only, as a complement to the main production, and they asked if I would consider appearing in them. Thinking that this might provide the Society with some valuable exposure, I said I would, and did a short screen test for the job. This must have been reasonably well-received as, although the short films were never made, to my surprise I was subsequently approached to present the new film about Petrie. A second, more thorough screen test was arranged so that a commissioning editor could decide whether or not to give this first-time presenter the job. Fortunately, in early September 2011, he agreed and production, under the leadership of Senior Producer (and, on this film, Director) Deborah Perkin, began. In the following weeks, Deborah carried out the bulk of the research, and then began writing the ‘treatment’, and finally a script. I acted as a consultant throughout, helping to provide ideas, books and articles from the library, archival photos and other documents (of which there is a great deal relating to Petrie at Doughty Mews of course), and suggesting possible contributors and locations for filming. 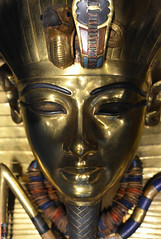 It was decided early on that the shoot would take place in the UK in two bursts either side of Christmas, and of course in Egypt and Israel. 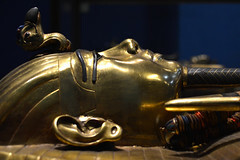 Deborah and her colleagues at BBC Wales had been inspired to make the film by the constant references made to Petrie by the Egyptologists and archaeologists they encountered during the filming of ‘What Lies Beneath’. His influence on our subject is still enormous and yet few people outside the field have heard of him. It’s the aim of our film to set the record straight. Petrie is a legendary figure, a giant of our subject. His entry in the new edition of Who Was Who in Egyptology is one of the longest of all. He published over a thousand books and articles, and more often than not was the first person ever to do any serious archaeological work at the most important sites throughout Egypt and Palestine. His voracious appetite for new information never left him, he was never satisfied, and seems never to have been put off the task in hand, no matter how difficult. Time and again he found energy and funds where others would have given up, and where there were no established methods available for recording or interpreting what he had found, he simply invented them himself, and in the process laid the foundations of modern field archaeology. 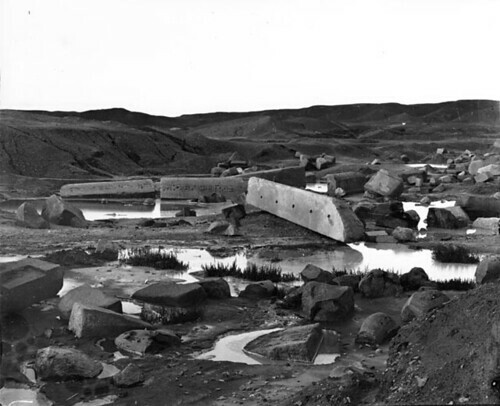 Photograph taken by Petrie at Tanis shortly after a rainstorm in February 1884. Of course, the EES has a very strong connection with Petrie. 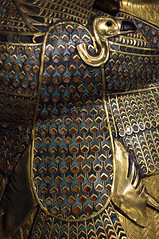 His first excavation in Egypt, at Tanis, was undertaken on behalf of the Society (then the Egypt Exploration Fund), which was in the very early stages of creating a reputation for itself. Petrie was invaluable to the Fund in helping establish its credentials in excavation but also publication, for which Petrie set very high standards in terms of the quantity and variety of material included, and the speed with which the volumes appeared in the hands of subscribers. Filming began on a cold but sunny morning in December (13th) 2011 in Hampstead where Petrie lived for much of his life. From there our small team – Deborah, Rob McDougall (Lighting Cameraman), Ali Pares (Sound Recordist), Peter Shuff (Runner) and I – travelled to UCL, where Petrie became the first Professor of Egyptology in Britain; then to the Institute of Archaeology, where a collection of material he excavated in Palestine is kept, to record an interview with curator Rachel Sparks; to the Petrie Museum (Debbie Challis and Stephen Quirke), and finally the offices of the Palestine Exploration Fund which sponsored his first excavation in the Levant and where a great deal of Petrie-related archival material is kept (Rupert Chapman and Felicity Cobbing). As I had been warned, the days were long – 10 to 12 hours – and quite unrelenting. There is so much to say about Petrie, and he covered so much ground, that the only way to do the subject justice was to try to cram in as many locations, contributors and stories as possible. This meant, however, that we were always battling against constraints of time, and in London against the traffic, and traffic wardens etc. I found those first two days of filming somewhat exhausting: there was a lot to do for all of us, and a lot for me to learn but it was very exciting at the same time, and a privilege to hear so many expert colleagues enthusing about our subject. I think we all found that very encouraging. We’d made a great start, but the adventure was only just beginning: the next sequences would be shot in Egypt.